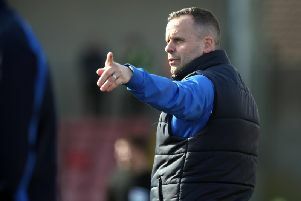 Ards manager Colin Nixon has added Institute striker Darren Henderson and Glentoran midfielder Eoghan McCawl to his squad. McCawlmade just eight league appearances for the Glens since joining in August 2017. Henderson joins from Institute, having previously played with Coleraine, Glentoran, Ballymena, Dungannon Swifts, Portadown and Carrick Rangers. The forward has scored over 100 Irish League goals. McCawl spent two years with Scottish club St Johnstone, during which time he was sent on loan to Forfar Athletic. Ards also announced earlier this week that they had acquired Linfield striker Jonathan Smith on loan until the end of the season.